An official product of the Isle of Man government, under license of the Department of Economic Development of the Isle of Man government. Manufacturers, vehicles, names, brands and associated imagery featured in this game are trademarks and/or copyrighted materials of their respective owners. "TT", "Isle of Man", and their respective logos are registered trademarks of the Department of Economic Development of the Isle of Man government. All rights reserved. Warning: This is a virtual game and not real life. 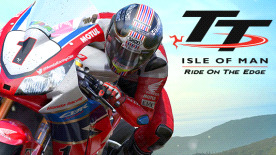 Be cautious, do not imitate the vehicle movements shown in this game when you are riding a motorbike in real life and don't forget to always wear adapted protections. Remember: ride safely!